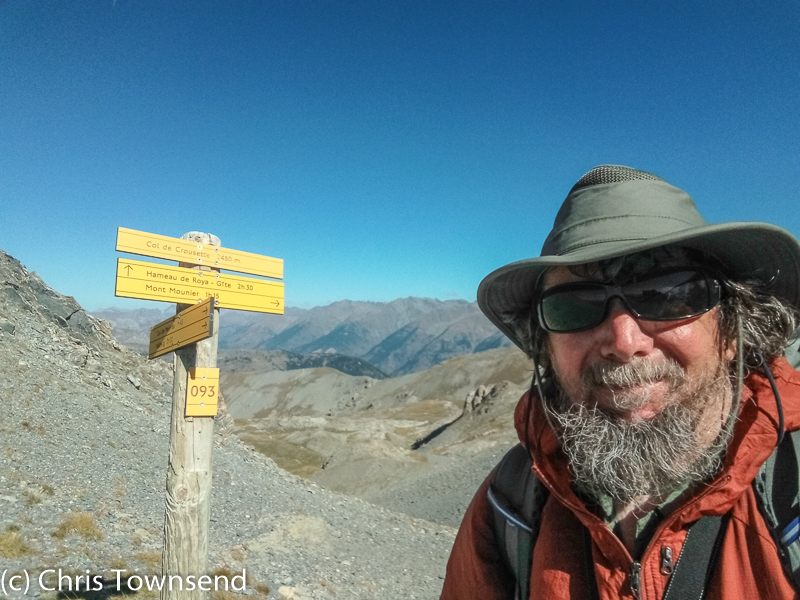 Eight days into my walk through the Alps on the GR5 I wrote a piece for The Great Outdoors about the gear I was using. At that time I'd had blazing sunshine, torrential rain, and four thunderstorms but no frosts and not much in the way of winds. In the following twenty-four days I had more storms, rain and sunshine, some frosty nights and some strong winds. In my feature I wrote that the trail was mostly steep and stony with much ascent and descent every day. It remained that way. For a late season walk like this I took a bit more gear than I would at the height of summer. When I wrote the TGO report I hadn't needed it. I soon did. 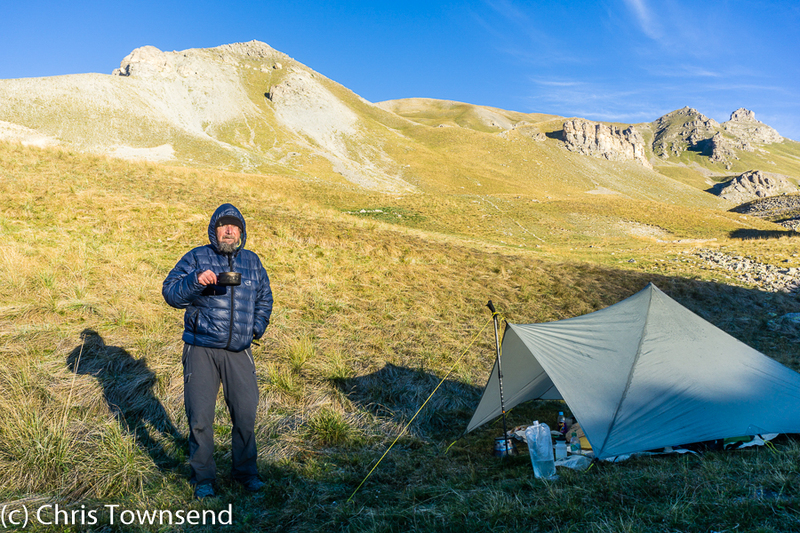 Here I’ve posted my first report with an update in italics as to how the gear performed for the rest of the trip. Much of the gear was well-used – some of it too much so! 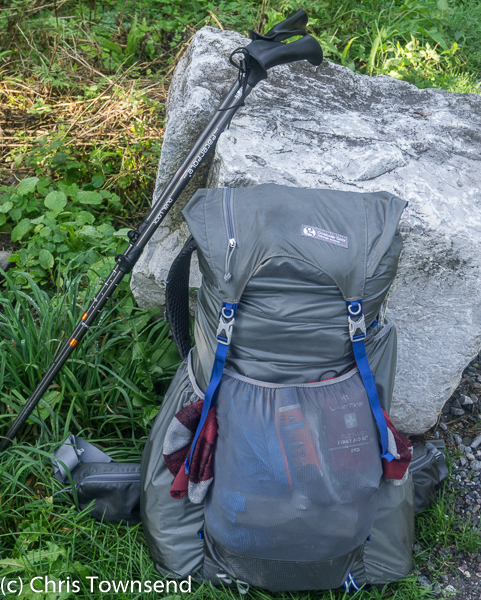 Having been impressed with it on short trips earlier in the year I decided the Gossamer Gear Mariposa would be just right for this trip. It's comfortable with loads up to 15kg, more than I expect to carry, but only weighs 945g. I love the huge front and side pockets which contain everything I might need during the day. So far the pack has been fine, if a bit sweaty on hot days. The pack continued to feel fine, even when slightly overloaded with more food than I expected to carry in the second half of the walk. Most shops were closed so when I did find one I bought food for many days. 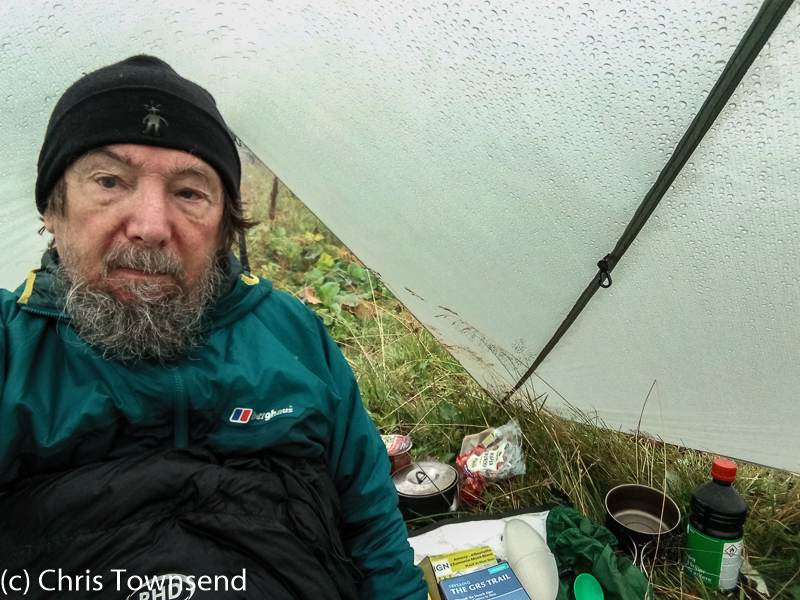 As always I'm using Pacerpoles and these have been as useful as ever on steep rough ground and essential for holding up my shelter. For the first time on a long walk I have the DuoLock ones which are much easier to adjust than the twistlocks. They weigh 570g but have only been carried on the pack for very short scrambles where I needed my hands (there are ladders and chains in some sections). The Pacerpoles continued to be essential. An item I’d never leave behind. 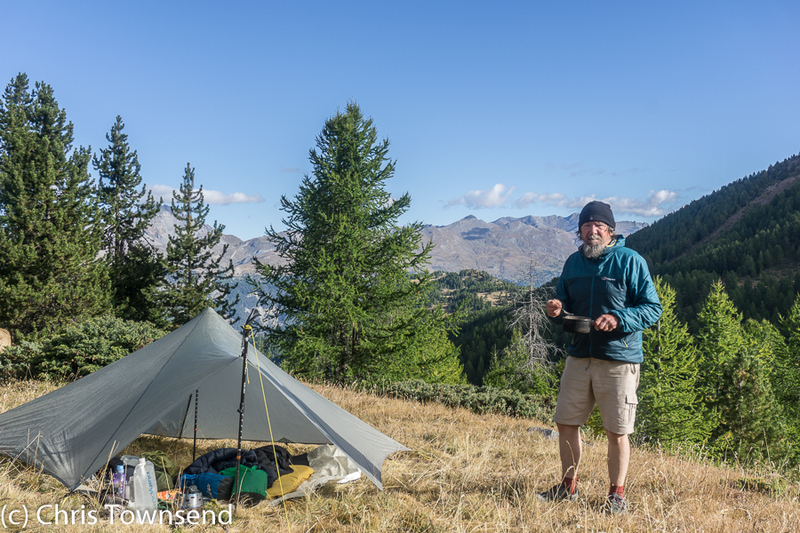 Mountain Laurel Designs Trailstar has been my favourite for many years now and I returned to it for this trip. It's stood up to an hours deafening cloudburst followed by a night of heavy rain so although well-used it's still waterproof. With pegs and Luxe Outdoor Ultralight groundsheet the weight is 767 grams. The Trailstar stood up to much more rain plus some strong winds and always felt secure. It’s proved harder-wearing than I expected for such a light shelter. The groundsheet kept out water when I camped on very wet ground a few times. By the time I got home it stank, the first time I’ve had this happen. It must have been due to camping on cow pastures on many nights. Hanging it on the washing line for a few weeks removed the stench. With a good chance of widely varying temperatures as autumn progresses I decided on the same PHD sleep system I used on my Yosemite to Death Valley walk exactly two years ago. This consists of the Minimus Ultra K and Filler K bags (combined weight 610g) and the Wafer K down jacket, trousers and socks (combined weight 447g). So far I've only needed the Ultra K bag as the lowest overnight temperature has only been 8°C. The last two weeks of the walk overnight temperatures occasionally fell to -2° and were mostly below 7°C so I used either the Filler K bag inside the Ultra K or the Wafer clothing if I’d been wearing it in camp. I never needed the clothing and both bags. To sleep on I have the Therm-A-Rest NeoAir XLite Short and an OMM DuoMat (combined weight 365g), also veterans of the Yosemite to Death Valley walk. Three days before the end of the walk an internal wall split on the XLite and one end began to swell up, though not so much as to render the mat unusable. This is the second XLite I’ve had where this has happened. I won’t use this mat again as more walls will probably split now. It was a well-used mat but I’m still a little disappointed and probably wouldn’t trust one on a long walk again. The weight is wonderful but I want reliability as well. As on other long walks the one fuel I'm likely to find everywhere is meths, here called alcool a’bruler, so I'm again using the Trail Designs Caldera Ti-Tri set up though with the new Kojin burner as fuel can be stored in this and it's more efficient than the original drinks can burner. The total weight is 225g. My pots are my now thirty plus year old Evernew and MSR 0.9 litre and 0.6 litre titanium ones (220g). They refuse to wear out! For water I have my usual 2 2litre Platypus bottles (87g) and GoLite 750ml wide-mouth bottle (79g). Having realised how much I needed to drink in the heat and with water sources sometimes a long way apart - some streams are dry - I bought a 500 ml bottle of Evian water to supplement the GoLite. I don't like carrying water far in the Platypus bottles as it sloshes around. Knowing there would be cows around I have a Sawyer Mini Filter (47g). I've needed it too. The first four days I was really out of the sound of clanging cow bells. One night I needed earplugs to sleep. All my kitchen gear continued to be fine, though the older of my Platypus bottles sprang a leak not long after I returned home. I only used the Mini Filter a few more times. 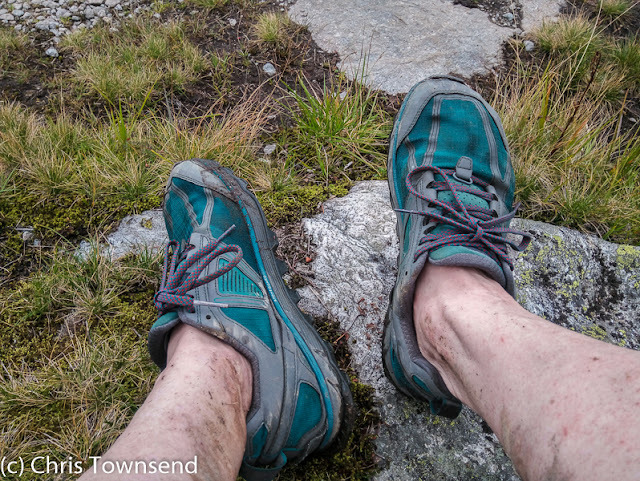 Having been impressed with three generations of Altra’s Lone Peak trail shoes I'm wearing the 4.0 and they are proving excellent with good grip and cushioning. When wet they've dried fast. In the hottest weather I've worn them without socks. When cooler with Teko Light Cushion Mini Crew socks. For cold weather I have Darn Tough Light Hiking socks, which I haven't needed yet. The Lone Peak shoes still have much life in them after the trek. I never had sore feet or blisters. I reckon they’re the best long-distance hiking shoes I’ve ever worn. The last two weeks of the walk I wore the Light Hiking socks quite often. They were fine at the end of the walk. The much thinner Mini Crew ones had a few holes. 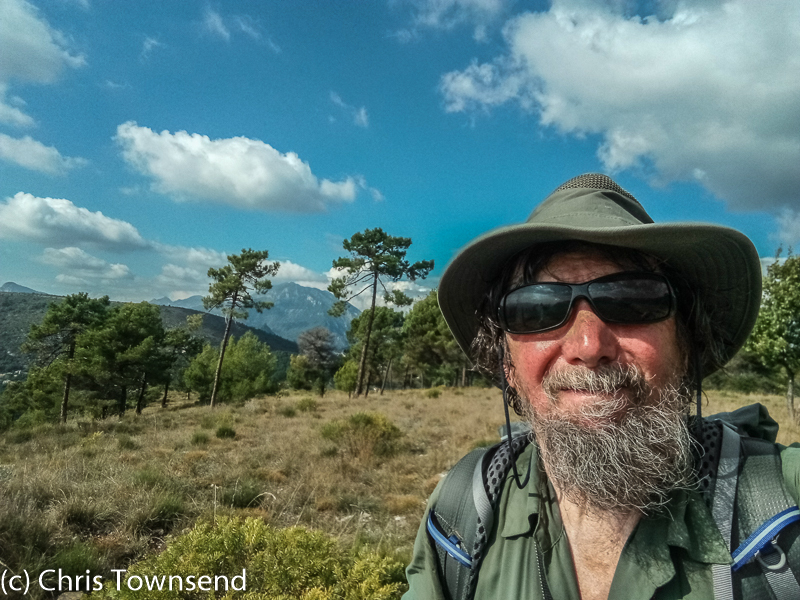 With temperatures warmer than expected I've mostly been walking in an old pair of Ronhill running shorts (79g) I chucked in at the last minute and the Paramo Katmai Light shirt (207g). The latter is nearly twenty years old and has been on my last three long distance walks. There are a few holes now and I reckon this is its last trip, which is a shame as it’s superb. I love the big pockets with Velcro closures - no fiddly buttons - and the wide easy to roll up sleeves. The silky fabric feels great and dries really fast. Best hiking shirt I've ever used. The Ronhill shorts started to rub so I replace them with a cheap pair bought in an end-of-summer sale in Chamonix. These were a bit longer and heavier than I’d have liked but otherwise proved comfortable and tough. The Katmai shirt just made it to the end of the walk though by then it looked very disreputable with several long tears and split seams. I’m hoping it can be repaired as Paramo don’t make it anymore. For camp and cooler weather I have Mammut Runbold trousers (310g), which are stretchy and comfortable, and a Patagonia Houdini windproof (111g). So far I've hardly worn them. Both of these were worn during the cooler, windier weather of the last three weeks, especially the Houdini, and both proved comfortable and efficient. 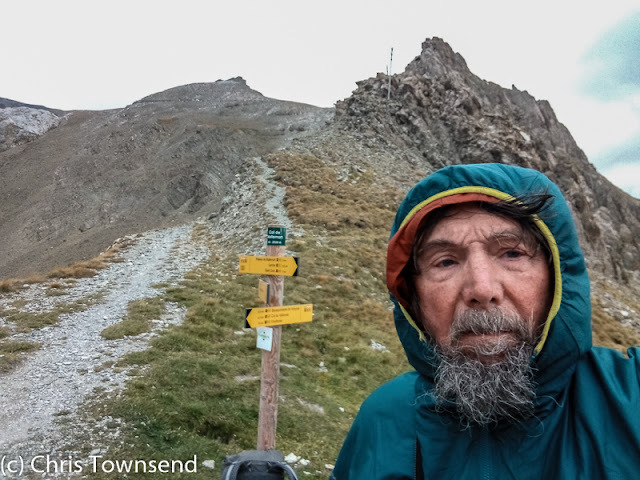 I have worn my Berghaus VapourLight HyperTherm Hoody (224g) in camp on cool mornings and evenings and occasionally on breezy cols. It's amazingly warm for the weight. Of course if it gets really cold I have the PHD down clothing as well. Later in the walk it was occasionally cold enough to walk in the HyperTherm and I needed the Wafer jacket over it at the coldest camps. The combination works really well. On the basis that big autumn storms were a possibility I didn't go for the most minimalist waterproofs, just ultralight ones. My jacket is the OMM Aether eVent (235g), my overtrousers the Montane Minimus (153g). They've been worn just once and only for a few hours but as that was during a torrential thunderstorm they were really needed. I'll be happy not to wear them again but if I do I know they'll cope with big storms. I did have to wear both again, and for many hours at a time during prolonged rain. Both worked well. On one very cold windy day I wore them over the Houdini shirt and the Runbold trousers for extra wind protection. Breathability of both was excellent. Other clothing for cool weather consists of my 20 year old merino Smartwool Beanie (56g), which I've worn in camp a few times, plus Sealskinz liner gloves (52g), an ultralight Black Diamond wool/nylon t-shirt (97g), which is on test and won't be available until next spring, and SubZero wool long johns (144g), which I could wear under the Mammut or Montane trousers in cold and stormy weather. The Smartwool Beanie saw much use during the second half of the walk, while walking as well as in camp. I wore the Black Diamond t-shirt under the Katmai shirt on a few stormy days too. I never wore the gloves or the long johns. 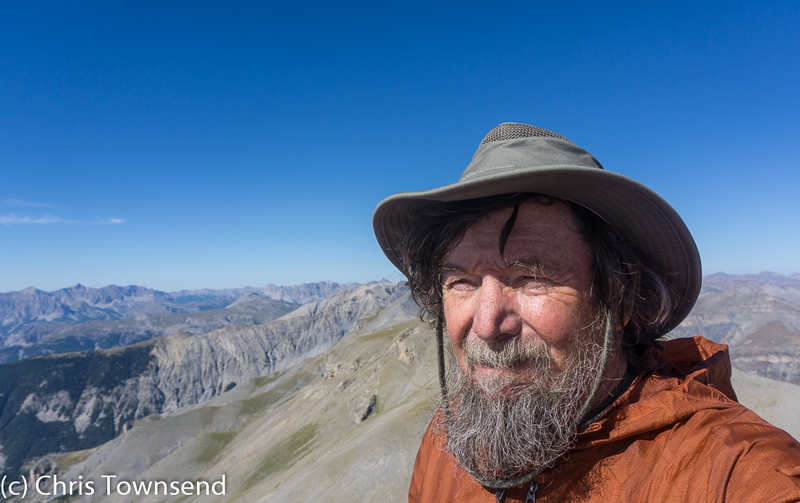 One essential item of clothing is my Tilley Hiker Hat (119g). It keeps the sun off and when soaked in water helps keep me cool. I've worn a Tilley Hat on every little long walk since 1990. I can't imagine being without one. 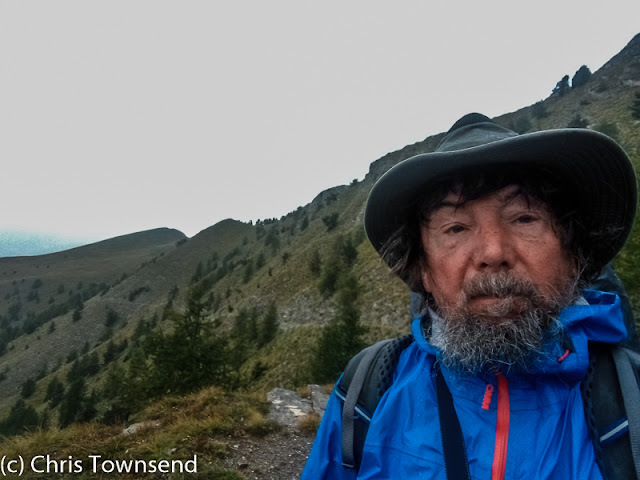 The Tilley Hat also kept off rain when it wasn’t very windy later in the walk. In strong winds it wouldn't stay on though. I have two test devices with me. The Land Rover Explore smartphone (161g) and the Casio Pro Trek watch (79g). The first, as you'd expect, is rugged and tough. There's no need for a case and it has matt ridged edges that make it secure to hold. 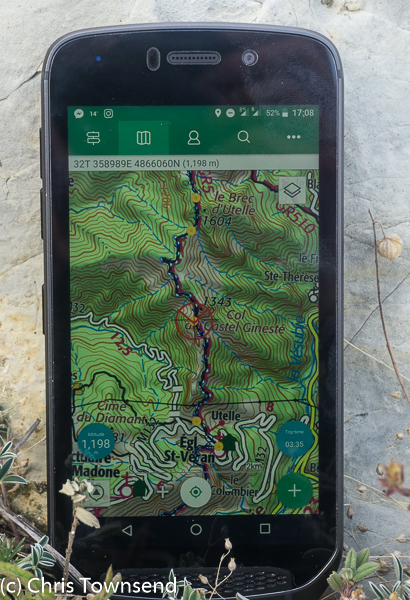 As a smartphone it's performance is ok and it has a number of extras useful in the outdoors. I'll do a full review after the walk. I'm using it with ViewRanger - I have the route on 1:25,000 maps - and it works well. The Explore comes with an Adventure Pack that attaches by magnets - no cables required. This is a 3620 mAh power pack with GPS booster. I like the magnetic attachment but it weighs 198g, making a 359g unit that is quite bulky and noticeable in a shirt pocket. The power doesn't last that long either, which may be down to the GPS booster. The latter makes no difference as far as I can tell. The Pro Trek watch has a nice big face that's easy to read. It does all sorts of amazing things but using them means the battery runs down in less than a day. Again there'll be a full review after the walk. Both items continued to work fine. 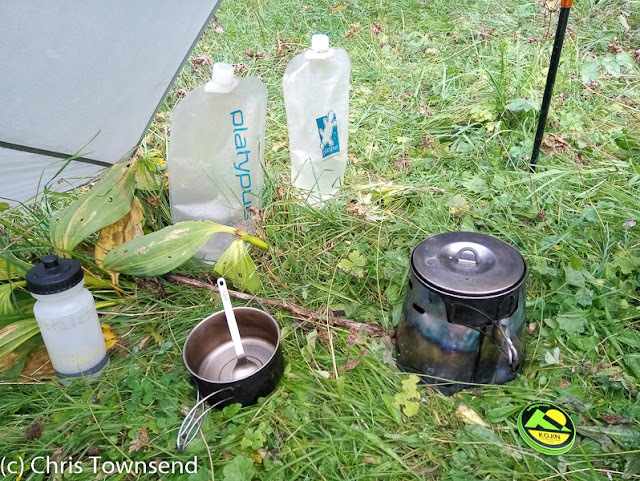 I reviewed them for The Great Outdoors – Land Rover Explore here and Casio Pro Trek here. Other items include the Cicerone GR 5 Trail guidebook (not weighed, not light! ), Petzl Actik and e-Lite headlamps, first aid kit, repair kit, notebook, Kestrel Weather Station, Kindle, sunglasses, reading glasses, and other odds and ends totalling around 800g. All this comes to around 10kg, to which must be added another 2kg of camera gear - 2 bodies, 2 lenses, ultralight tripod, camera bags. I reckon with several days of food and a few litres of water my pack weighed 16-17kg at its heaviest. Did you use any kind of solar charger on this trip? If so, how did it perform? Or did you just rely on the power pack? I set off with an old solar panel but it broke after a few days. Until then it worked well. If I was doing a similar walk I'd certainly take one. Hi Chris, do you think that the Sawyer mini-filter is sufficient to make water safe to drink in cow/animal pastures or do you also treat/boil water after filtering? I didn't get sick so I guess the Sawyer filter was sufficient! I didn't treat or boil filtered water. You were asking this question to Chris but I would like to add that I used the Sawyer-mini on the Arizona Trail last year to filter really bad watersources (some literally had deer poo floating on them) and didn't get sick. I would recommend the Sawyer-Squeeze though (used this year on the PCT - never got sick) because it maintains a much better flow over time. Thanks to both for your replies, very helpful. Hi Chris, great post. Did you experience rainsplash during the rainy night? Have you ever used a bivy inside the trailstar, or do you prefer not to? I never had any problems with rainsplash. 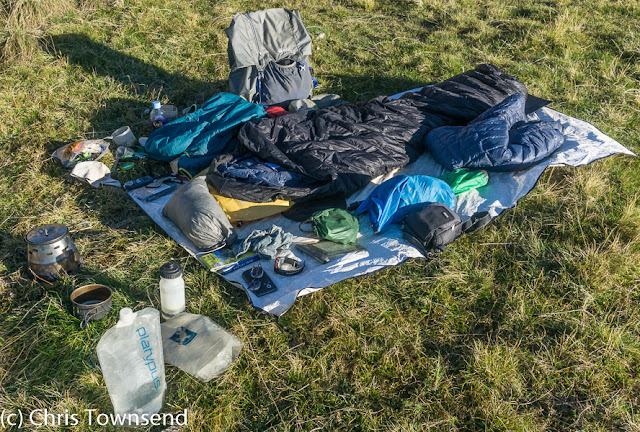 I see no need to use a bivy inside the Trailstar. I've never done so. Thanks for your advise. Im going to try it out soon. I uselely take a bath tub Floor, but this is for one persoon. And still to heavy for my taste. 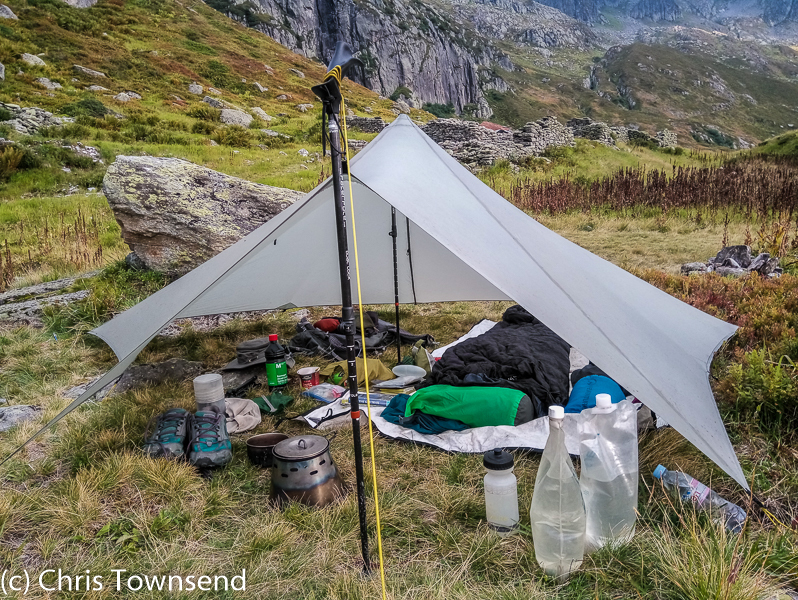 Sometimes the pitching of the trailstar cannstill still be a bit challenging. ( i think maybe the fabric has stretched.) A while back, we got wet from wet snow. I also own a copy of your backpacker manual on gear. Really like this book. Cheers. Thanks for the write up. Noce to see your hypertherm is still going steong. I bought one nearly two years ago on the strength of your review and a email reply from you about its uses. I have never regretted it. Great piece of kit for camps and cold stops. How did you find the Houdini compared to all the other windshirts youve used, especially the ME one you reviewed recently (the aerofoil i think it was). I liked the sound of its soft feeling fabric. I presently use a Rab Windveil. Also enjoyed your report of the trip as well. Thanks again. Great to hear about your travels. Have you ever found the Trailstar footprint to be too big. I have thought about a TS many times but put off by its size. Hi Matt, thanks. If the Trailstar was a fixed shape the footprint could be a problem. However as it's a tarp not a tent it can be pitched in many different ways. I'be always been able to make it fit - though sometimes I've had one side half way up a bank and at others boulders and bushes inside.